It is that time of year again. Everybody is thinking about “what the h*ll am I going to get for my dear friend.” We are looking for small gifts and larger presents. If you are looking for gifts for bloggers – this post is for you! We need ideas for people we know well and acquaintances that we don’t know for a long time. Some friends have been such a huge help in the past that we want to express our thankfulness, some gifts should be useful and some others should simply make someone smile. Whatever you are looking for, you will find some ideas on our list. I admit that we always have something sweet near our laptops. Something to give a quick boost of energy. And chocolate not only gives you new power it also helps to lift your mood and make you happy. I am kind of obsessed with good chocolate. With this one, you can also be environmentally friendly. The cocoa comes from small, family-owned farms and 10% of the profits help to save some at-risk species. This is just the truth – and the travel mug is simply awesome if you don’t always blog from home. This is so true for me: I run on coffee. Jonathan claims I get totally grumpy if my caffeine level drops – I strongly disagree and say that I NEVER get grumpy at all! Let us be honest: We bloggers have superpowers; there is no denying that. We run our own business (our blog), often we do that while we still have another job, are parents, dog owners, travelers, or just friends. We live our life to the fullest. Bloggers are just awesome! 9. Tea – we need more tea! Even if I would love to, I should not ONLY drink coffee. So in winter when it is cold outside and I love the feeling of a warm mug in my hands, I love a good cup of tea. And a lot of bloggers love to have a steaming hot cup of tea beside their laptop. The smell alone can inspire some new ideas! My guess is that most of your blogging friends already have a laptop. It is the one piece of equipment we bloggers cannot live without. But there is so much fancier technical equipment that we bloggers would love to have – I am sure you can find some inspiration here to add to your blogging friend’s toys. Bloggers lif with their laptop and mobile phones. Without them, we are basically out of business. When we are traveling and our battery dies, we feel like a smoker without a smoke or like sitting in the jungle without any contact to the real world. But there is a solution to this problem, an external battery or power bank. It can be a lifesaver! 11. Still running on a laptop? How about a tablet? I admit that when I am traveling I often prefer my tablet for a lot of social media work. While I don’t want to write complete blog posts on a tablet, sharing, engaging and posting on social media can all be done comfortably on a tablet. Plus, for browsing the Internet and reading blogs a tablet is often my first choice. Why not give a new iPad – that would be an awesome motivation for any blogger! 12. Your friend already has an iPad? How about a new case? Or, if your blogging friend already has an iPad – maybe just a beautiful case could be the thing. Have you counted how many ebooks you have read? I can’t count them anymore. And what better to read all those lovely books than a Kindle? It not only is a lightweight in your luggage and easy in your hand – it will also save you a lot of weight when you want to take many books with you. When you work a lot with your tablet, you will need a stand to put it up or have it beside your laptop. 15. Videos with your phone? You need a tripod! Video is the thing right now. Whether it is Facebook, Instagram or Youtube – Video os booming. A mobile phone is often enough to shoot the video – but a tripod comes very handy when you are a solopreneur and want to shoot a quick video. 16. Always on your knees? A lap desk is the solution! I admit it, I always have my laptop on my lap. Wherever I am even at home, I rarely sit at a desk. A lap desk could be the solution – check it out! Whether your blogging friend wants to watch youtube videos or listen to audiobooks or podcasts, a simple headset will be appreciated. If your friend is planning on creating a podcast or webinars, a slightly superior headset may be the better choice. If your blogging friend is seriously thinking about starting a podcast, you might want to check out Jonathan’s post on how to get a podcasting setup on a budget. I have already collected some awesome digital marketing and blogging books in some other blog posts. If you are looking for a book to give as a gift, check them out. But there are more books that make an awesome read for entrepreneurs and bloggers. Bloggers need a laptop bag! 27. How about totally classic? Don’t forget to stay fit! I admit, nce I turned entrepreneur and blogger I sometimes struggle to stay fit and do enough for my body to keep back pain and other aches away. Especially, when working on a new project or with a new client, I get so focused that before I know it is late and dark and I missed my workout again. It helps to have some little pieces of gear right by your side – either in your office or at home near your favorite workplace. So here are some little pieces of equipment that can help a busy blogger fit in some exercise between blog posts and creating products. I started using a Gym ball when I was working on my PhD – in my life before becoming a blogger. But everybody who sits a lot can make good use of the ball – even when you are not planning on doing exercises with it. Just sitting on the ball instead of a chair once in a while can help to avoid back pain. Fitting in some small exercises in between blog posts is a great way to stay fit – and profit from being your own boss. A Yoga Mat is simply the basic equipment you need to start getting fit. I first came across foam rolling in a fitness class. It hurt like hell. But it can work wonders to relax some hurting shoulder muscles that are tight from sitting at the laptop all day. I also recommend using the foam ball for your hands and feet! This is one piece of simple fitness gear that allows such a broad variety of exercises especially for the arms and back that it is perfect as office equipment when you want to fit in some simple exercises. If you think about giving some of the sports equipment, this little book with exerciss might be a great addition! I seriously hope that I gave you some inspiration and ideas for awesome gifts for bloggers. 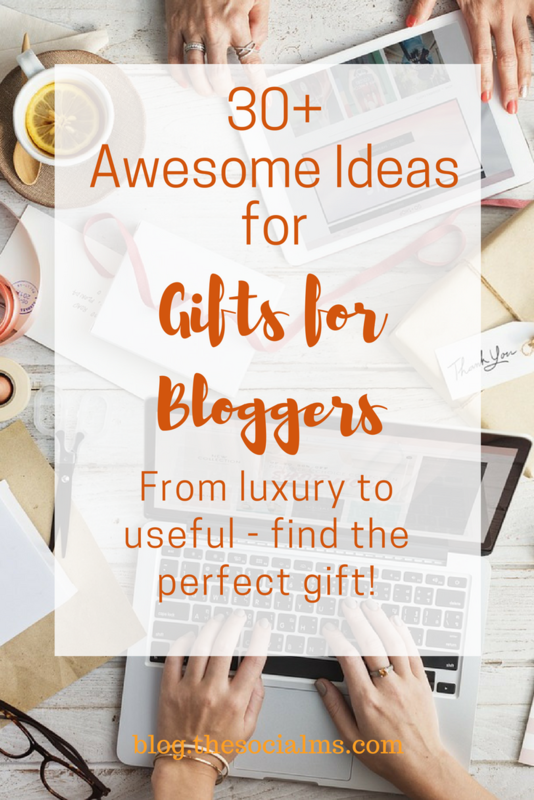 If you are missing something, or have more great ideas that would make great gifts for bloggers, please let me know in the comments – and I will expand the list!